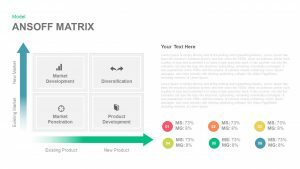 Download Ansoff matrix PowerPoint templates and take your business, marketing strategies to a next level. Business professionals, entrepreneur know the hardships of growing a successful business. They can’t stick with a business as usual mindset. Thus, Ansoff Matrix PPT helps senior managers, professionals to analyse various factors a devise strategy for future growth. 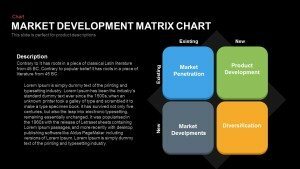 Ansoff Matrix slides precisely focuses of four major factors which revolves on growth alternatives of business, it includes: Market Penetration, Market Development, Product Development, Diversification. Using Ansoff PowerPoint Templates in a presentation gives a clear vision how a new product or service can go best for organisation growth strategies. Using these templates, a complete matrix can be illustrated in a single diagram. 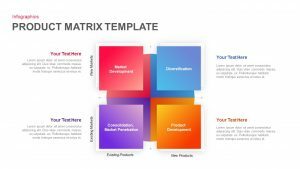 Ansoff Templates ae one of the best PowerPoint templates for strategic and marketing planning’s. Our collection includes versatile designs which can be added by start-ups as well as Mnc’s. The layouts are highly editable which features all the information in a striking manner. Eye-catching color palette, attractive icons make the template suitable for any business presentation.